First Bus drivers strike ballot; Willie Wallace of the Unite Union after the ballot. Bus drivers have voted to down tools “indefinitely” in one of the most disruptive acts of industrial action to hit Aberdeen in recent history. Despite optimism following crunch talks with mediator ACAS last week, members of union Unite have rejected the latest proposal from First Bus and will be walking out from tomorrow. The union has suggested that new negotiations could take place as soon as today, but in a statement First said it had delivered its “final offer” and would now be taking time to weigh up its position. Of the 320 drivers in the union balloted, 255 voted with 58% rejecting the offer. This marked a significant climbdown from the initial vote last month, where 95% of members were not in favour. Drivers fear their new contracts could leave them up to £5,000 a year worse off, with less holiday entitlement and longer shifts. Unite’s regional officer Willie Wallace said: “I think with the changes to their terms and conditions, our members feel strongly enough that they’ve said they’ll be on indefinite strike until we get this sorted. He added: “It was a difficult negotiation with ACAS, but we felt it was right to take the offer back to our members. “They’ve had a chance to vote on it and they gave us a clear message that it’s still not sufficient enough. 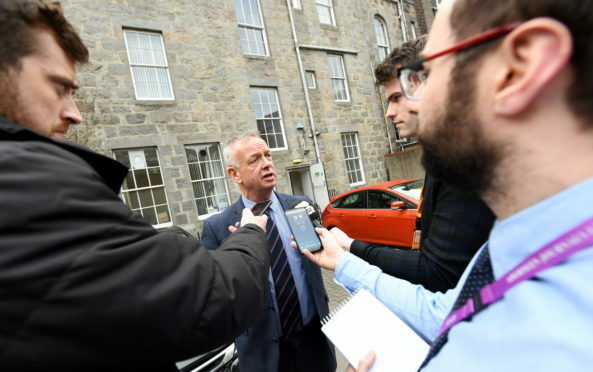 Last night First Aberdeen’s operations director David Phillips refused to answer questions from the media, and instead read a statement outside the company’s King Street depot. He said: “We were absolutely clear that this was the best and final offer on the table despite the current reality of the situation facing the business in the city. “We were willing to go to these extra lengths to get the city’s bus services back to normal and end the disruption, so to see this voted down via ballot is very concerning indeed. Adrian Watson, the chief executive of Aberdeen Inspired, said business owners are already worried about the repercussions. Many firms have reported drops in footfall, with customers unable to travel in because of the reduced bus timetables that has operated on the recent strike days. Mr Watson said: “There’s a bit of concern and angst in the city centre. “The businesses aren’t taking any side on the dispute but the longer this goes on the bigger adverse effect it has on them. A spokeswoman for Stagecoach North Scotland said: “All of our services will be operating as normal in Aberdeen.